It’s that time of year again when the holidays bring food, wine, and if you’re lucky, an overabundance of presents for all good little girls and boys. If you’re around children this year, or have a niece or nephew who you’ll be celebrating the festivities, you know their excitement can be infectious. Like ferrets on a caffeine buzz, they run about with radiating smiles, eager to share their new toys. Their actions are not determined by logic, but rather sparks of inspiration. Unfortunately, this excitement and pure joy for life ebbs as we grow older, leaving us with a more tempered manner when speaking of the things we love. Fortunately, this tendency is not true for all! A few days ago, we were fortunate to have met someone who reminded us of what it is like to be truly passionate about what you do: to love your job as much as you love life. Nearing the end of the medieval festival, our friend and fellow wine writer, Raymondo, chose to seek out a delicious vinous treasure while we perused through various options of roasted meats. In the backstreets of Vic, off the main route where all the festivities were taking place, he encountered Cellar d’Osona. And having brought back a lovely bottle of Catalan wine that was both appreciated and emptied in 20 minutes time, Raymondo prompted a second trip to the cellar. Now, most of you are aware that I can criticize the perpetual lack of wine selection in most shops in Spain rather quickly. Often we are left with standard Rioja legends and a few local treasures to choose from. And for this reason, we rarely write about wine shops, but this was clearly an exception. Miguel Bofeil, and his wife, set a new standard in wine retail. Upon entering their shop, they warmly welcomed back Raymondo like a long lost friend. Introductions followed, with handshakes and kisses, but it wasn’t until he understood our profession and passion for wine, when a sparkle suddenly flared in his eye. Miguel is a lover of flavor, history and people. He held each bottle like a sacred gem allowing stories about the owner, creator or moment he enjoyed the wine flow over his lips. He spoke of wine makers such asÂ the late Didier Dagueneau of the Loire ,in reverent tones, who he caimed as a friend. As well as a local Catalan wine making genius (in his own words) Josep Trallero whose Cava, a blend of many obscure varietals, was quickly shoved in our hands as a gift, while insisting there were no others like it (story to follow, we promise). Miguel is a man possessed by wine, and in love with its magical ability to connect people with the world. Top German Reislings, obscure and rare burgundies, and local treats that I have never heard of or thought existed, all lined his shelves – each one a precious gem in a temple to wine. We were traveling light but wanted to buy a bottle as a token of gratitude for his existence. We asked him to show us a Garnacha Blanca that epitomized uniqueness. Without even blinking, he placed into my hands a Mas Carreras 2007 from the Emporda. Looking closely, I realized that Miguel was actively listening to my request, rather than selling me whatever he had high stock of, when I read the consistency of the blend: Garnatxa, Samsó and Picapoll. Different? Yes! Samsó is a red grape, and this is a white wine. I love the unexpected! Leaving the store, it was almost like leaving your family when you don’t know when you’ll make the second trip again. Hugs and kisses were handed out over an atmosphere of a shared love. 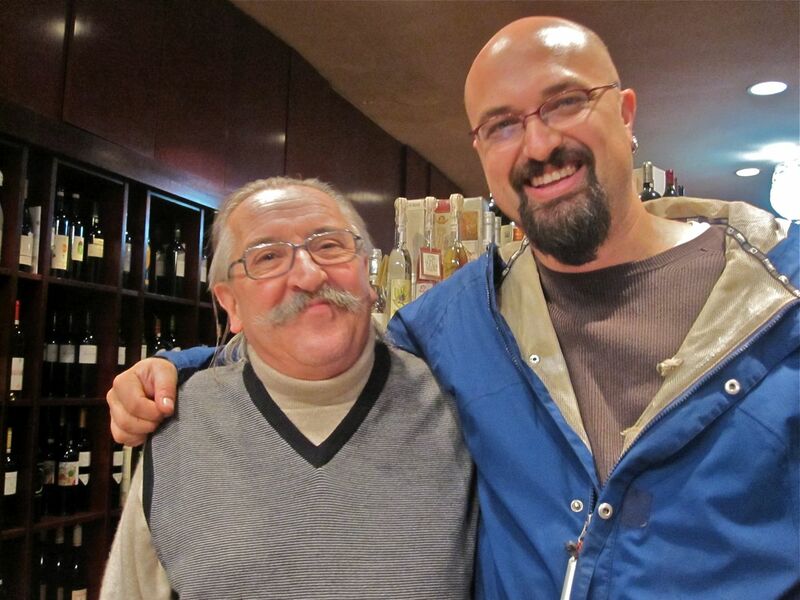 Miguel gave me faith that wine is a unifier of communities and creator of friends. Thank you Miguel and I toast you and your shop, I just hope that a few of you readers can find the time to make the trek to this little wine shop in the Catalan hills. Oh and the wine? A bit tropical on the nose, it shows a light hint of red berries with a subtle spiciness. In the mouth, it’s creamy and rich, with a slight oxidation that offers a appealing texture; and vibrant acidity brings it alive, leaving you with a lovely memory of the wine as you swallow. Different yes, and good to boot!